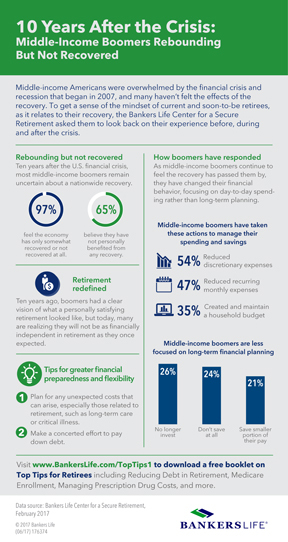 (NewsUSA) - Ten years after the U.S. financial crisis of 2007, a survey from the Bankers Life Center for a Secure Retirement found that middle-income boomers feel less than secure about their financial future, with almost 100 percent surveyed saying the economy has not fully recovered, and 65 percent believing they have not personally benefitted at all from any recovery. 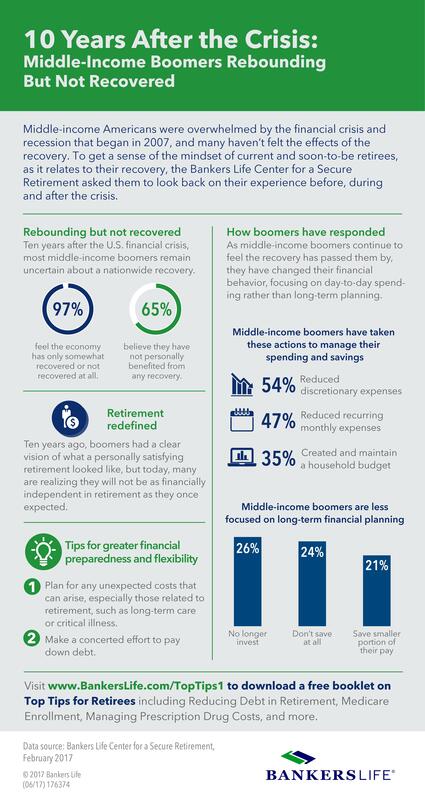 Prior to the economic crash, many baby boomers had a clear vision of their retirement, but now say in all likelihood they will not be as financially independent as they once thought. Fortunately, resources from organizations such as Bankers Life can help middle-income boomers better plan for retirement with useful tips and how-to's, because no one should have to choose between having to pay for long-term care and buying groceries.